During the 14 months we lived Down Under, we only traveled once to Queensland – Australia’s second largest state that covers the continent’s entire northeast. Queensland’s main attraction is a gorgeous coastline stretching nearly 7,000km that is home to the Great Barrier Reef, the world’s largest coral reef system. Although there are dozens of tours exploring the GBR, I think your best option is to depart from Port Douglas. 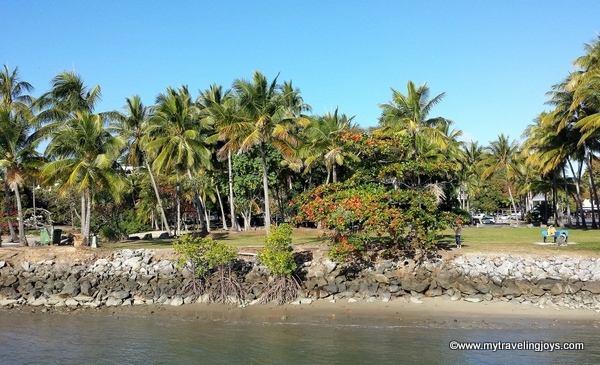 During our long weekend trip to Queensland, we flew into the city of Cairns and quickly retreated up north to a quiet beach town called Palm Cove, which seemed less touristy than other destinations. I selected a snorkeling tour with Silver Series which allowed a bus pick-up from Palm Cove for an additional cost. The whole point of this trip was to have a relaxing weekend on the beach so we wanted to limit our driving as much as possible. 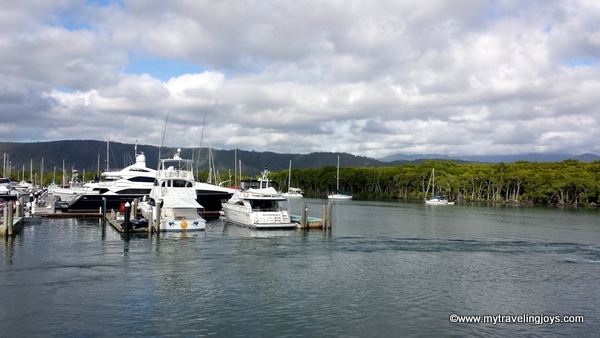 We quickly departed the bus once we arrived at the Port Douglas Marina and followed through an efficient queue that led us out to our awaiting catamaran. Palm trees and clear blue waters seemed to flank the marina in every direction I looked. I’m sure Port Douglas would have been a pleasant place to stay as well. Of course the main highlight of this trip was snorkeling in the Great Barrier Reef – an experience that we’ll never forget! If you’re looking for more articles about Queensland, then please check out: Dreaming of Palm Trees in Palm Cove, Under the Sea and Snorkeling Among Colorful Coral in the Great Barrier Reef. 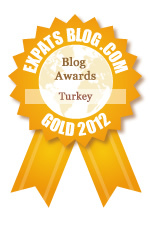 I’m linking this post to the monthly travel guide link up organized by Fiona, a fellow Australian blogger, at Tiffin Bite Sized Food Adventures. Each month features a new letter of the alphabet. This month is the letter “Q.” Please pop on over to Fiona’s blog to read more travel stories or feel free to link up your own! yes i didn't want to be obvious by choosing queensland or queenstown but needs must! :) Darn hard to think of a Q place. Even tho we live in brisbane we rarely go to FNQ - too hot for us. We prefer cooler climes for our hols. Well, well, well... Queensland has turned out to be very popular. In fact, the only person who didn't use Queensland was a fellow Queenslander. You still have one up on me as I have never been to Palm Cover or Port Douglas. I think we will probably visit in the next few years. Get your thinking caps on for X!